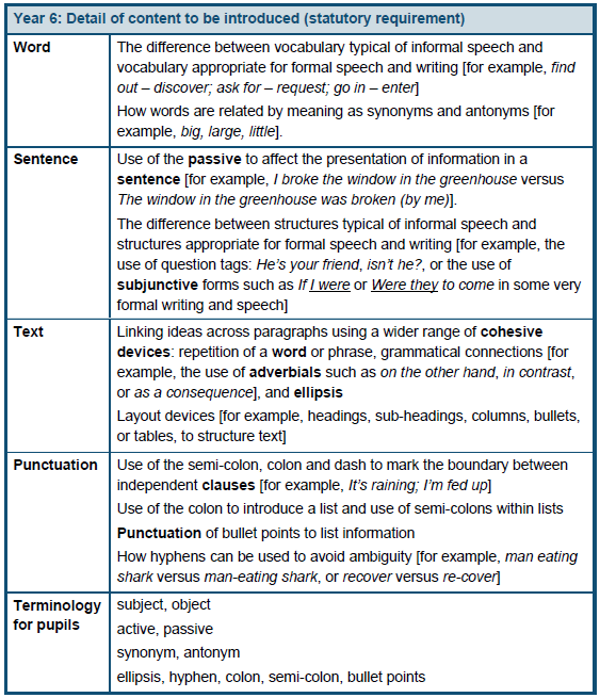 The National Curriculum for English in Year 6. Hover over blue text to see non-statutory examples. En6/1e give well-structured descriptions, explanations and narratives for different purposes, including for expressing feelings. En6/2.1a apply their growing knowledge of root words, prefixes and suffixes (morphology and etymology), as listed in English Appendix 1, both to read aloud and to understand the meaning of new words that they meet. En6/2.2h provide reasoned justifications for their views. En6/3.3e perform their own compositions, using appropriate intonation, volume, and movement so that meaning is clear. En6/3.4c use and understand the grammatical terminology in Appendix 2 accurately and appropriately in discussing their writing and reading.